Shortly after the Bolshevik leader Vladimir Lenin died, the city was renamed Leningrad (supposedly by public demand). During the years of the Revolution the population of the city had dropped dramatically and the city was slow to recover from the rigors and tragedies of the war. In the late 1920s mass construction of cheap housing for workers became a very prominent feature of the Leningrad landscape. Many cultural centers, "palaces of culture", were built to provide the city's people with entertainment, clubs and other social activities. In terms of architecture most of what was built was rather modern and less than inspiring. The large apartments that had been constructed during St. Petersburg's Imperial era were turned into "communal" (shared) apartments, housing several families. Life was not easy in the socialist city of Leningrad, but the population was to suffer even greater hardships during WWII and the dramatic 900-day Siege of Leningrad. This was undoubtedly the most tragic period in the history of the city, a period full of suffering and heroism. For everyone who lives in St. Petersburg the Blokada (the Siege) of Leningrad is an important part of the city's heritage and a painful memory for the population's older generations. Less than two and a half months after the Soviet Union was attacked by Nazi Germany, German troops were already approaching Leningrad. 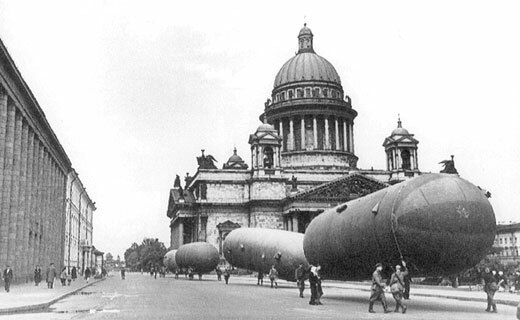 The Red Army was outflanked and on September 8 1941 the Germans had fully encircled Leningrad and the siege began. 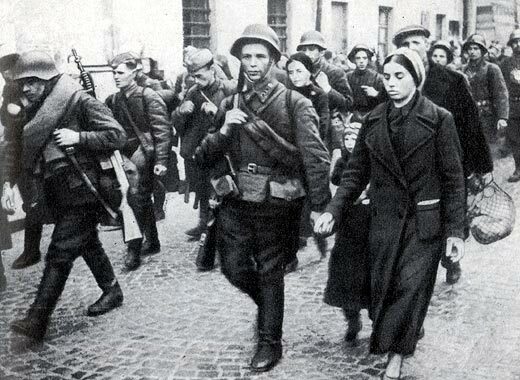 The siege lasted for a total of 900 days, from September 8 1941 until January 27 1944. The city's almost 3 million civilians (including about 400,000 children) refused to surrender and endured rapidly increasing hardships in the encircled city. Food and fuel stocks were limited to a mere 1-2 month supply, public transport was not operational and by the winter of 1941-42 there was no heating, no water supply, almost no electricity and very little food. In January 1942 in the depths of an unusually cold winter, the city's food rations reached an all time low of only 125 grams (about 1/4 of a pound) of bread per person per day. In just two months, January and February of 1942, 200,000 people died in Leningrad of cold and starvation. Despite these tragic losses and the inhuman conditions the city's war industries still continued to work and the city did not surrender. Meanwhile, the city lived on. The treasures of the Hermitage and the suburban palaces of Petrodvorets and Pushkin were hidden in the basements of the Hermitage and St Isaac's Cathedral. Many of the city's students continued their studies and even passed their finals exams. Dmitry Shostakovich wrote his Seventh "Leningrad" Symphony and it was performed in the besieged city. In January 1943 the Siege was broken and a year later, on January 27 1944 it was fully lifted. At least 641,000 people had died in Leningrad during the Siege (some estimates put this figure closer to 800,000). Most of them were buried in mass graves in different cemeteries, with the majority in the Piskariovskoye Memorial Cemetery, resting place to over 500,000 people and a timeless reminder of the heroic deeds of the city. The Alexander Column is the monument to the victories of Russian Army over Napoleon in the war 1812 - 1814. It is situated in the centre of the Palace Square. The column was designed by French architect Auguste Montferrand. A huge pillar which is 47,5 meters (156 feet) high and weighs over 600 tons stands on the pedestal hewn out of a single piece of granite.